After five months of being on hiatus in my online reviewing, I am officially back. 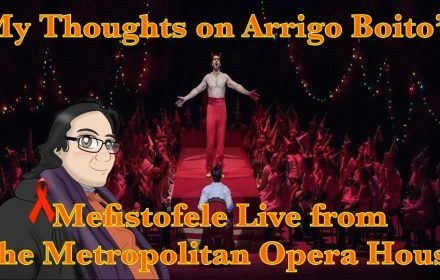 What better way to herald my return to vlog-style opera reviewing than with my review of the Met’s radio stream of Arrigo Boito’s Mefistofele starring the virile Christian van Horn, the charming Michael Fabiano, the mighty Angela Meade, and the fine Jennifer Check. Enjoy the review and let me know your opinions as well. What better way to send off the 2017-2018 Metropolitan Opera House season than with the radio broadcast of Gounod’s Roméo et Juliette starring the dashingly mellifluous Charles Castronovo and the gorgeously alluring Ailyn Pérez. Enjoy the review and let me know your opinions as well. Let’s see how this production of Puccini’s Manon Lescaut starring Kristine Opolais will fare. Enjoy the review and let me know your opinions as well. Yes, I did sound a bit worn out in this video review, but let’s just say my voice kind of gave way to a film shoot I was involved in. But it was getting better, I just needed to rest my voice. Sonya Yoncheva, Piotr Beczala, and Placido Domingo make their role debuts in one of Verdi’s rarely performed operas as the tragic characters of Luisa Miller, Rodolfo Walter, and Old Man Miller. Enjoy the review and let me know your opinions as well. Let’s see how Sondra Radvanovsky, Matthew Polenzani, Elina Garanca, and Mariusz Kwiecien fare on my book in this cult classic of a Donizetti opera. Enjoy the review and let me know your opinions as well. Diana Damrau, Matthew Polenzani, Mariusz Kwiecien and Nicolas Testè! With a scintillating cast of singers like this, this was a very worthwhile evening. Enjoy the review and let me know your opinions as well. P.S. I thought Patricia Racette was a decent host as she had enough charisma and charm to liven things up. Also, I do apologize for some of the background noise in this review as my flatmate had guests even though he was aware I was making this Vlog style review. Plus, this was made two years ago. So, I hope you enjoy this video. Angela Meade’s mighty Queen Semiramide, Elizabeth DeShong’s sterling Arsace, Javier Camarena’s dashing Idreno, and Ildar Abdrazakov’s handsome Assur lead a cast of all-star bel canto singers. Enjoy the review and let me know your opinions as well. My time here in Oslo has come to an end and what better way for my trip to go out with a bang than with this charming production of Donizetti’s L’Elisir d’Amore live from the Met headed by Maestro Domingo Hindoyan and starring Pretty Yende and Matthew Polenzani as the iconic lovers, Adina and Nemorino. This also marks the successful debut of one baryton noble, Monsieur Davide Luciano as Belcore. Enjoy the review and let me know your opinions as well. Madamigiella Sonya Yoncheva rose up to the challenge to take on one of Puccini’s most dramatic and iconic heroines of all time, the great diva herself, Floria Tosca. Accompanying her as her lover was the ardent and impassioned Vittorio Grigolo. Enjoy the review and let me know your opinions as well.